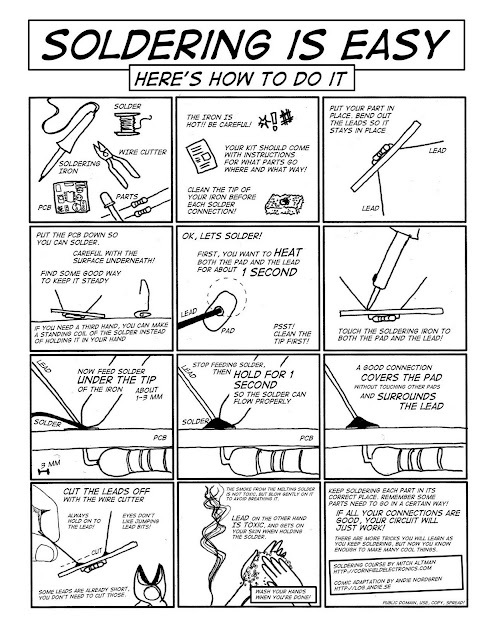 I wanted to pass that on, and thought a comic adaptation could work to teach it, and that having 1 page of instructions that could be pinned to the wall next to soldering stations in hackerspaces, handed out at workshops, or just used to refresh the basics would be a good idea. So here it is - 1 page on how easy soldering is, and how to do it. It assumes you have the tools and kit/parts you need, and a basic idea of what soldering is and why you’d want to do it.